Working in tandem with Dropcards, we offer a variety of different types of digital download services to fit our clients' varied needs. From deluxe plastic full color cards, custom URL's and hosting platforms to simple black and white coupons with a standard download platform, we can definitely provide you with the type of download service you and your budget require. 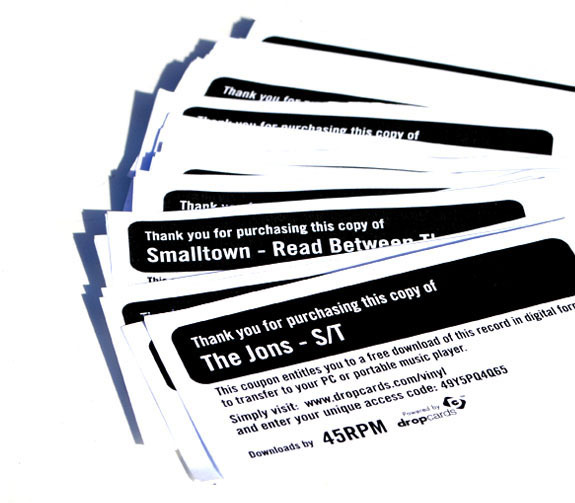 Our most common package, fittingly called "45RPM" includes hosting for at least 2 years, as well as the printing and insertion of simple paper coupons into your product. For a small fee we can even customize the cards with your logo or set you up with a custom URL for the program. Digital downloads are fast becoming an integral player in the growth of vinyl, and their ease, affordability and the effect that they can have on the sales of your record are profound. Don't forget to ask about adding download coupons to your product when ordering!